Sending professional, business related emails to clients and colleagues is an integral part of modern business, but can also be confusing. From formatting to punctuation, modern professionals need to seem polished, polite, and intelligent, but many have little knowledge of how to present themselves well through email. Use the Professional Email Template Outlook Document available free on this page to remove the uncertainty. Simply fill in each field with the appropriate information and allow the built in formatting to make sending professional emails quick and easy. 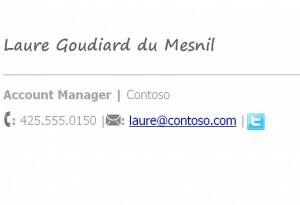 First, download the free, easy to use Professional Email Template Outlook Document from this page. Second, fill in the sender and recipient information in the indicated fields without changing the formatting and punctuation. Third, fill in the body of the email with the desired message. Break this information up into logical paragraphs and use complete sentences and proper punctuation. Most email programs offer spell check and grammar check. If yours lacks these functions, consider typing the body of your email into a word processing program to check for errors. Then copy and paste into the body section of the email before sending. Carefully proofread your email before sending, paying special attention to names and other sender and recipient information. Mistakes in these areas are especially easy to miss, look very unprofessional, and can even alienate potential clients or colleagues. Consider creating a personalized email signature for an added edge of professionalism. A personalized signature saves time, lets the recipient know how to contact you, and lessens the likelihood of typographical errors because there is less you have to type for each email sent. If your email program allows, consider setting this template as the default email message so each time you create a new message the template is already in place. Presenting a professional image via email should be simple. The free Professional Email Template available for download from this site makes it quick and easy to write professional looking emails that are sure to get noticed.